Have you used a chiropractor or done acupuncture on your horse? Everyone is unique, horse and human. When I go to a chiropractor they tell me, “Make an appointment for next week” but they tell my husband to make an appointment in a few months. I have tested this with several different chiropractors over the years and have come to the conclusion that my husband just doesn’t have the need for as much chiropractic work as I do. I have used equine chiropractors because I see results with chiropractic myself. Does that mean that every horse is in need of chiropractic? Maybe not. Hopefully they have a spine that is more like my husbands and less like mine. I actually use a spin of what I learned from my human chiropractic experiences to evaluate my horse chiropractor; if they tell me all the horses have problems, I get suspicious. My first and most dramatic experience with chiropractic happened when I was a teen. My mom’s horse had struggled with soundness issues, refused to take one lead and then took a turn for the worse one winter. He was very stiff almost to the point of refusing to move. My mom had several vets look at him and they all agreed it was arthritis and there was nothing that could be done. As a last resort my mom found an equine chiropractor (this was years ago when they weren’t common). After the first visit the horse TROTTED out of the barn…the same horse that was barely walking the day before. I have seen equine chiropractic make dramatic changes in a horse but the horse was dramatically lame. The major improvement was possible because there was a major problem. Most of my horses don’t have major problems and I am using chiropractic for fine tuning or prevention. I have used acupuncture on my horse once and found some improvement. I am happy that my horses don’t have extreme issues but it does make it more difficult to evaluate the results. 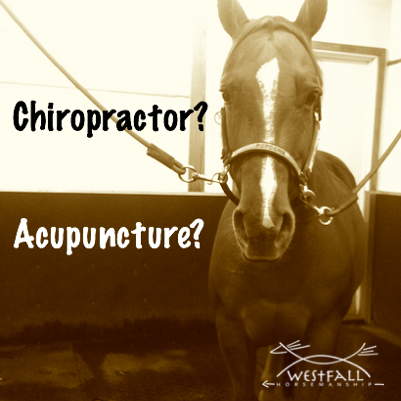 Have you used chiropractic or acupuncture with your horse? Please share your story so we can all learn from it. ← What about dismounting from your horse, mounting block or not? This is a really interesting read! I’ve never considered that horses would need a chiropractor. It’s good to know that there are equine chiropractors. Much like your horse that your family used to own, one of my horses currently has arthritis. It’s incredible how your horse was able to trot out of the barn after one visit from the chiropractor. I should look into finding an equine chiropractor for my horse to help treat her condition. Thanks for the tips! When I got my first horse in my late fifties, I noticed a couple little things about her that just seemed off a bit…consistently. She would drop back to a walk when not asked to do so, she would move up to a trot or canter very slowly. There were a few downhill places that she didn’t really like & would try to go around instead of down. She also didn’t like to pick up one hind leg for me to clean her feet. I asked more experienced horse friends to look at her or ride her to see what I was feeling and they all told me she was just lazy, working me and had my number! My farrier said there were issues and my vet agreed but thought we might watch for some stifle issues. found that in general she liked to work and liked to please but something was making her uncomfortable. I tried finding Veterinary chiropractors in three states and finally found one I could trailer to about 2 hours away. I chose Dr Michelle Kruising in central Wisconsin because she is a holistic veterinarian and because she was recommended by a breeder who used her chiropractic work on one of her studs. The first adjustment seemed so dramatic to me that I actually thought my horse was going to be unable to stand in the trailer for our hilly curvy ride home. I walked her out for a while after the adjustmentand Dr. Kruising assured me that she would be safe for trailering. there was a time of rest and light work before I rode her again but from the second day she seemed like a relieved horse. as I learned how cooperative she was after the adjustment and how she truly seems to enjoy her job I realized how stoic she had been before the adjustment. That first year I think we agreed on 3 adjustments. each time there were fewer places that needed adjustment & the adjustments or more subtle.The following 2 springs I took her for an examination & tune up adjustment. It has not seemed like she needed it the last two years & I am ccontemplating taking her again this year. a riding companion decided to take her own two horses to Dr Kruising after seeing what she had to admit was a dramatic improvement in mine. One of her horses had a few areas adjusted, seemed to enjoy it & moved well after but doesn’t seem to need regular visits. The gelding who was about 20 at the time & a beautiul mover only needed a slight adjustment at his poll & nowhere else….nor does he need regular adjustments. I think it interestiing that the gelding had been slightly head shy his whole life & that situation seemed to improve slightly.because of my own experience on my own body and with my horse. Chiropractic is a primary consideration for me in any behavior or movement issues. I should to add my mare’s posture also seem to improve after the adjustment.I also stress how subtle her original issues seemed to but what dramatic improvement I felt I got from the adjustment. I also learned to trust my own gut with my horse throughout this situation. I do believe though that many people are missing out on what is important here-and that is too incorporate Massage into the program! If your horse is ‘out’ somewhere, that is caused by tight muscles and spasms pulling the bones out of alignment. Many times people complain ‘the adjustment didn’t hold’..it’s not that it didn’t hold, it’s that you didn’t get anyone to come first and loosen the tight knotted muscles first, so that it wouldn’t pull it back out of alignment! Combining massage first-and then chiro is the best way to help your horse to get better, and back into great shape. Many times there is nothing out of alignment, it’s just some sore muscles that need to be worked on-just like people. And Massage Therapy is the only way to help that! The best program is with Massage first then in between chiro visits, Most horses that I have worked on with Dr. Haverkos, only needed chiro 2-3 times per year! And they were in heavy training-mostly at the track or top show horses. Also too, if you have a good EMT, many times you don’t even need a chiro, because the softer muscles allow the bones to go back into place many times. Just like with us-have you even turned your head and heard a ‘crack’..that’s you adjusting your own neck-horses do it too, usually by shaking their head, rolling, etc. These are things I teach my students, and most of their clients have experienced this too-keep your horse pain free with massage, and you will rarely need a chiro. I believe all things in moderation, and the right medicine/treatment for the right diagnosis. With that said, I have witnessed chiropractic work on horses in combination with equine message therapy truly make a difference, and I’m not a “Kool Aid” drinker type, but seeing is believing. At a barn I once worked at, a new boarder had brought to us a retired TB gelding with dangerous ‘issues’ and all the stable hands were made aware. We were told he reared with ground work and bucked on flatwork and no amount of training was helping. Effectively, their teenage daughter had lost interest and no-one EVER came to visit the gelding. They had been to several boarding facilities before us and we believed their constant moving due to the horses behavior and the liability it presented. Our group, teamed together with a plan after each of us experienced his ‘issues’ during regular turn-outs. With all of us on the same page we minimized the rearing to 1 out of 100 times instead of 9 out of 10. However, none of us were allowed to ride. We all agreed we could detect some underlying cause by the shyness of his head to be handled and his sensitivity for his back to be groomed. On a whim we asked questions from our regular Chiropractor that visited our barn, and presented the gelding’s problems to her. She said if we could get the owners to agree she would take a look. But she must have had a gut feeling to how much pain he was in by our synopsis, that she took a risk and asked to see him. As she began to trace her hands along his body to get a ‘feel’ she said he was in bad shape out of alignment and all the ‘issues’ we described were spot on with her evaluation. She felt so bad for him that she took an even bigger risk, with only our consents and not the owners, she proceeded to actually work her ‘magic’. All us agreed if nothing changed nothing was lost, no harm no foul. But we did see a change! Even those of us that were not aware of the work the chiropractor did, felt compelled to ask the others of us the next day if we notice something ‘different’, something BETTER about the gelding. His demeanor and mood took complete 180 improvement, you’d swore he was a different horse. One of us, not myself, but one girl particularly fond of him, approached the owner and questioned their intentions with him and asked if they’d consider selling. Indeed they did sell, immediately to the girl. They had to have been on the constant move praying someone would take him off their hands. As it turned out, the girl never told his former owners what we all had discovered and with continually therapy and corrections he proved a wonderful riding mount that never bucked again. If the previous owners had cared enough to try, just try out side the norm they would’ve discovered it for themselves. Their loss, was the horses gain! I’m in California and we have a wonderful Chiropractor, we call him Marvin the Marvelous! He used to work on people/now horses – he says the horses are more honest!! The horses love him, I found him through my trainer and he’s the only one she’ll use. He does an extensive teaching session with the horse owner on the first few visits or whenever is needed, he’s very patient and thorough so that we can test our own horse and determine when to call him out. He doesn’t like wasting people’s money or anybody’s time. I use a gel pen, a specific small diameter pen in specific locations with about the same pressure you would use if you were writing with a pen – I can pretty much tell Marvin which vertebrae/rib is out and after he fixes my mare we both just sigh… I can see the relief in her and all tension go away. The first time we saw him it was monthly for about 3 months to fix an obviously long standing problem when I first got her but after that I maybe call him out 3-4 year. I’ve seen some good and some hokey chiropractic and I’ve seen injuries caused by chiropractic so you really need to be careful. We’re grateful we have Marvin, he’s in Watsonville and we’re in the East Bay but he makes the trek and we schedule the heck out of him – we have a whole list of people and he drives from barn to barn fixing and educating….. So if you’re looking for a chiropractic I would just say, find one that also educates YOU so that you’re scheduling a session when your horse needs it, not just because the chiropractor is “coming out that day” your horse will love you for it… And hopefully your horse is like Stacey’s husband and doesn’t need it much haha!! I have a horse that has struggled with soundness issues most of her life. She had regular visits to the chiropractor and it always helped, however she never held her adjustments very long. I was so frustrated and because I live so far away from the chiropractor I decided to take a course in Equine Massage Therapy http://equineenthusiasm.com/equine-massage-therapy-pursuing-passion/. I had wanted to do that since I was a teenager anyways so this horse was my driving force! It made a HUGE difference for her, she began holding her adjustments for longer, her range of motion increased over time, and she was having an easier time driving from her hindquarters and not traveling so heavily on the forehand. I was amazed at the results! I love massage and I am a FIRM believer in chiropractic when the need arises. I have been very fortunate to now have the opportunity to work alongside my equine/vet and chiropractor and she has been so supportive of my equine massage work, which has meant so much to me since I live in a state that is not overly open to alternative medicine! For me, massage in conjunction with chiropractic has made a huge difference in my horses performance! My equine vet is also in the process of becoming an acupunturist (sp) and I am super excited to get to learn more about that as well! Sorry for the long winded reply! I can’t help it, I just get so excited about this topic!! Thanks so much for this awesome post! I use Chiropractic on my dog – he injured himself being a Weimaraner and when we went to see the Chiropractor she said that he had actually pulled his pelvis out of alignment. This was my show dog, and my heart dog and I was very sad to see him hurting. She adjusted him, and I am happy to say his is now a Canadian Grand Champion, UKC Champion and also has several performance titles. I also go to the Chiropractor, so I was very open to the idea of using it for my boy. We now just go about every 6-8 weeks for maintenance, or before a show or trial just to make sure everything is where it is at. I know the barn owner where I ride has used Chiropractors on the horses she owns, but I don’t currently own a horse. I use a chiro on my horse and it has made a WORLD of difference! She wouldn’t pick up her right lead and would sometimes buck at the lope. Then one day she turned up lame and I had 3 vets out and none could figure out what was wrong with her, so I decided to try a chiro. Boy was that ever a life saver for my horse. The first year the chiro had to come out once a month to work on my horse but after that first year it got to be less and now we’re on the 3rd year and I only see the chiro 3 times a year and Gracie is great in b/t sessions. I highly recommend everyone giving a chiro a try..at least once! My husband and I decided to take a chance on a nice young buckskin AQHA gelding that was in a “killer” pen at a horse auction. After getting him home we realized that he was broke to ride but often kicked out at a trot or would buck at a gallop. He also held his tail crooked. A trip to a chiropractor had him licking his lips and he was visibly relieved. He has been a working ranch horse here for two years now. I wonder how many horses have been put down that could have been easily helped. I am definitely a firm believer in both! I have two OTTBs, one of which never needs treatment and the other who needs regular adjustment. From my experience horses are like humans – some need it and some don’t, some regularly and some only every now and again. I’ve found it important to find out what suits your horse and even those that don’t need adjusting, do get them checked twice a year just to make sure they are ok. I am taking an Equinology course in March to improve my knowledge of equine biomechanics, horse massage and acupressure. As a horse owner this will help me a lot in identifying their pain and problems and correcting issues as they arise. A pain free horse is certainly a happy horse! Yes we have san excellent one who never pulls that.trick with either of us. But he has an internationional reputation working out of Spruce Meadows in Calgary as well as overseas in thé Winter as well as thermal. I don’t know if I believe in chiropractors or not, but my horse LOVES it. I don’t go to one myself, but tried it for my horse as we’ve been trying to diagnose a lameness for quite some time. It hasn’t made his lameness 100% better, but he loves the adjustment and really does feel better after. Yes, years ago, when I was a racehorse groom, one of the owners used Chiropractic, and it definitely helped. I now have a horse rescue and have used both Chiropractic and Acupuncture as well as Nutritional Reflexology and other natural therapies on the rescue horses. I definitely like the changes I see in the horses after natural therapies. I’m a horse trainer. when I don’t see changes in the body during an expected time frame or I feel we have a flexibility problem over and over I ask a therapist to take a look at the horse. Once after the treetment the saddle suddenly didn’t fit anymore at all (it fit well before) because the horse was suddenly able to lift the back. The whole horse looked different after one treatment. I think you have to choose the type of therapist after the individual needs of the horse. there’s no point in saying physical is better than chiro or akupunctur versus lighttherapy or whatever. it shouldn’t be a question of personal beliefs but what is best for the horse. I have had a chiropractor work on my gelding, he’s 16yrs old, and I am amazed at the difference in him. His top line is actually straight and he moves much smoother than before the visits. He also gave me exercises to loosen him up before a ride. My husband thinks I’m crazy, but it’s helped my horse a lot! YES! It is worth it! Especially as horses age and are asked to continue doing jobs that they still love but are not as easy…my vet has told me on multiple occassions that every horse over 7yrs old has some level of arthritis- we must take care of them in every way that is possible to us! I had an OTTB that I was asked to present for Dr. World’s Most Awesome Vet, who did chiropractic oogedy-boogedy for Most Special Clients. With the college team watching, he tried to diagnose my horse in the farm’s yard. My horse said “no thanks.” We took him into the indoor, where Dr. Wonderful demonstrated his amazing skills on the other horse, and then came after my TB again. Having been polite once, my horse went ballistic. Dr. Wonderful went home. If even conventional practitioners have not nevidence that what they do is effective, the chances that those who practice with ZERO evidence of efficacy (apart from testimony from the Kool Aid drinkers) are preying on gullible people with more money than sense. Show me one large scale, randomized trial conducted according to established scientific methods and published in a peer-reviewed journal that demonstrates the value of chiropractic methods in either animals or humans, and I’ll be glad to reconsider. My cousin’s horse was being treated for colic, with refluxing, medication, IV fluids, etc. He hadn’t had a bowel movement in several days. The vet told her to get prepared for a burial. I drove her to tell him bye, but I said we’re trying one last thing. We called a Vet that specialized in acupuncture. After the afternoon treatment, the horse pooped and was eating the next morning. That was app 7 years ago. He is around 28 years old and still being used for trail rides! I am actually hoping to be an equine chiropractor and am not quite sure which route to take. I was wondering… Would someone prefer a veterinarian who had studied animal chiropractic, or a chiropractor who also works on animals? From what I can gather, vets and chiros take the same 5-6 month program after they get their DVM or DC. It depends on where you live, I believe some states or provinces require animal chiropractors to be vets. Do your research first in the area you want to live and good luck. If you go the route of DC (human chiro) in some states, you must be a vet with training. I feel both have good results. The DC is obviously more trained in chiro than a vet who has taken a 6month course…but the chiro needs to be sure they can spot when it’s more than a skeletal issue. And I have been told there are classes for that. So it depends on what the problem is…are you sure it’s just a skeletal issue? Or could there be something else? Something neurological/disease wise that is looking like a chiro issue. I have a horse with kissing spine and through Chiropractic work from a Vet certified as a Chiropractor, and with exercises and my homework, she is now completely sound and I am riding her. She is an OTTB that I believe had an accident at the track. Her right hip and left shoulder seemed to need adjusting, he has come twice, and now she is sound. She canters both leads where before she would not pick up the left lead ever, she now has no problem either way and throwing lead changes. The massages/exercises I do seem to make little improvements every day. She has been sound for about 3 months now and I think I will have the Chiropractor out one more time as we come into spring and I start jumping her. I do also get Chiropractic work on me so I know it is very effective with the right Dr. I work for a vet that does acupuncture. We see awesome results all the time and animals don’t lie about how they feel. To see that dramatic change in one visit will make a believer out of you! And my gelding needs far less treatment than my mare. Reining is a demanding sport so I want to keep my horses as comfortable as possible. Yes, we have had chiropractic and a acupunture done on our horses. Our grey had one of his hips that was out of sync. When he walked the one hip was way higher than the other. We had to have a couple of sessions with him…then he was good for a couple of years. But it made a big difference in how he rode! We have also had our dogs in for chiropractic and acupuncture. My first experience was with my current filly. I broke and rode her for a year and hit a stage in her growth where she became hard to fit so I swapped to a treeless saddle. Well, she started off great but over time because more stiff, head up, hard in one lead vs the other etc. the chiropractor found all her thoracic out due to the saddle pressure on the top of her withers, her spine out where riders sit (I have a well established seat so it’s not from bouncing too hard), and her hip out on one side. Her stirnum shifted and her neck and shoulder out possibly due to the strain to get away from the pain in her withers and back. 3 days off and a normal saddle and she was a new horse!! She now gets regular visits. I have seen other horses with their own share of issues have dramatic differences including a U-necked horse that would walk out with his head hung low and relaxed. I have used both chiropractic and acupuncture on the same horse. The horse was acting very “ouchy” when any pressure was applied to her croup and she became very resistive when being bridled. The chiropractor adjusted her poll and pelvis and she was much better. Within less than 1 week she began showing the same problems. I called Dr. Ronald Anders from Coldwater, Ohio who performed additional chiropractic adjustments along with acupuncture. The transformation was nothing less than amazing. Bridling went from a 10 min. fight including head butting, to a 30 sec. task. She no longer fought lead changes or turns and became fun to ride. Needless to say, everyone who knew the horse was very impressed with the improvements. Dr. Anders also taught me how to perform periodic checks to see if a horse needed acupuncture. This is a technique I will always check a horse for if it shows any signs of having a problem. I am a FIRM believer in acupuncture. I am a Physical Therapist Assistant and experienced in manual therapy and trigger point work as well as mobilization techniques. I perform manual therapy on my horses to maintain good balance in their bodies, so I have never had to use a chiropractor. I have used a chiropractor for my horse and i always find that she moves more fluid after a visit. I have a chiropractor that comes out quarterly to work on my mare. We started this when she was lame with a soft tissue injury. She really seems to like it and moves a lot better afterwards. I have done a lot of research on it myself, so I do one or two less intense sessions a week. I recommend it to anyone.